Rest assured they haven’t forgotten about the days of the “Wishbone T” at Texas. Among the glorious eras of Longhorn football, the span from the late ‘60s into the early 70s when the Darrell Royal “Wishbone” ran wild remain among the all-time favorites for the countless “Texas Ex-es” and college football historians. The high-water mark, we have always believed, of that great Wishbone era might continue to be mostly overlooked by college sports historians and the modern-day media. In fact, looking back upon it, a game with the background and dynamics of the 1970 Cotton Bowl will probably never be repeated. And that classic battle has been more than a bit short-changed in any debate among historians for best-ever, and most important-ever, college football clashes. Even though it entered that Cotton Bowl ranked on top of the polls, Texas was not necessarily the main storyline for that clash almost 49 years ago. Rather, the re-entrance of Notre Dame to the bowl mix was the dominant narrative of December 1969, and still resonates nearly 50 years later. The background leading up to that clash reads like its own tale, but the game itself would live up to expectations. The Fighting Irish also provided a chance for Texas and the Royal Wishbone to legitimize the Horns to the national audience, many of whom a bit skeptical leading up to the Cotton Bowl despite UT carrying an 18-game win streak into New Year’s Day. Though Royal’s ground-gobbling offense, piloted expertly by QB James Street and a squadron of north-south runners led by punishing FB Steve Worster and HB Jim Bertelsen, was the talk of the college football world, the Horns had mostly been dominating regional opposition. The one venture outside of the Southwest in ‘69 was a late-September trip to Berkeley to face a modest Cal team. Texas won, but it was a workmanlike 17-0 decision; the Horns only managed a FG by PK Happy Feller in the second half as the Golden Bear defensive adjustments held the ‘bone in check. Texas had surged to a 14-0 lead at the break and did amass 311 rush yards, but in the end it was not a performance to overwhelm the masses, especially those from elsewhere in the country who could have been excused for believing the Horns a bit overhyped. Texas stayed at number four in the polls after the win. The previous ‘68 season did not begin auspiciously after an early draw vs. Houston and loss to Texas Tech out of the gate. It took a while, however, for the "Wishbone" label to stick to Royal’s new-look offense, installed with the help of asst. Emory Bellard (a future Texas A&M & Mississippi State HC) to make sure FBs Ted Koy and Steve Worster could be on the field at the same time with star HB Chris Gilbert. At the outset, it was called the "Y-T" and was much derided as it ran counter to the more pro-style passing offenses that were infiltrating the college ranks. Soon enough, however, the more-catchy "Wishbone" became affixed, and the Horns began to rock, not losing the rest of the way after the 0-1-1 start. (That's Street, Bertelsen, Worster, and Koy pictured to the right.) Moving out "Super" Bill Bradley at QB (first to WR, then to safety, where Bradley would eventually enjoy a good pro career) for option wizard Street, who effectively took over after the Horns fell far behind in the Texas Tech loss, was another key development. But it was mostly vs. suspect regional opposition (save Arkansas) in the Southwest Conference; even the impressive 36-13 Cotton Bowl win vs. an overmatched Tennessee, when the ‘bone keyed a 513-yard offensive surge, was greeted with some skepticism, as the Vols were not from the Big Ten, Big 8, or Pac-8...and not Notre Dame. Yes, the Fighting Irish were ranked only ninth entering the 1969 postseason...but this was NOTRE DAME! IN A BOWL! How those words put together had seemed so incredible at the time remains hard for the modern-day fan to comprehend, but in December of 1969, it was met with almost the same sort of slack-jawed astonishment and disbelief as Neil Armstrong’s first walk on the moon five-and-a-half months earlier. Thus, the chance to face the Fighting Irish would prove the acid bath for Royal and the Longhorns as they sought ultimate validations for their mounting win streak and claim to number one. The circumstances that delivered Notre Dame to Dallas, however, remain hard to comprehend, and still reads like its own novel almost 50 years on. And, by us, part of what still might be the most fascinating matchup of our 60+ years of TGS publishing. Looking back, of all of the long-ago storylines from the bowl no-repeat and no-participation era during our earlier days of TGS, none would approach the annual debate that would surround Notre Dame, which had adhered to a strict no-bowl policy since “The Four Horsemen” participated in the 1925 Rose Bowl and beat Stanford, 27-10. The policy would generate increasing debate throughout the ‘60s after the arrival of HC Ara Parseghian in 1964 and the quick re-elevation of the Fighting Irish to national prominence. Still, despite much pressure and heated discussion, Notre Dame continued to avoid bowl participation through the 1968 season. But the story of how that change of policy finally came about almost 50 years ago remains a fascinating tale. We have always been humored by a quote from Notre Dame's then-AD Moose Krause, who, after the Domers accepted a bid to play Texas in the January 1, 1970 Cotton Bowl, stated that the modern convenience of air travel was one of the reasons the Irish decided to reverse course on the no-bowl policy. Which, predictably, moved several wags to comment that while Notre Dame invented the glamour of college football, it took the Irish almost 45 years to discover the airplane. By the 1950s, trans-continental air travel had long since replaced trains as the preferred mode of long-distance transportation; the Irish would no longer risk being on the road almost a month as they were when trekking to Pasadena and the Rose Bowl in 1925. For reasons that can only be understood through the lens of hubris (long a staple in South Bend), Notre Dame avoided bowls for decades, according to many, to simply stand out from among the rest of the college gridiron world, and not be regarded as a dreaded "football factory" as had so many rival institutions. This from a school that received more benefit and notoriety from the gridiron than any other. Financial realities, however, became too hard for the school to continue ignoring in the late '60s. That's when Parseghian, a fervent proponent of breaking the bowl ban since his hiring in 1964, was gathering enough support from the Board of Regents, which now included a number of football-minded laymen, to overturn the school's decades-long bowl ban. For Parseghian, the benefits were obvious. More recognition for his squad and program from the expected TV ratings bonanza, not to mention more chance to recruit in specific areas of the country. For the school, the benefits were more practical. In a word, money. Serious discussions about repealing the school’s no-bowl policy had begun as early as June of 1969, when ND’s Financial Committee on Scholarship aid discovered it needed help. Notre Dame already was up to the top of its stadium in fund drives totaling $52 million, and, thus, some other source of revenue would be required to aid a program for underprivileged students. The Rev. Theodore Hesburgh, then president of Notre Dame and a longtime hardliner regarding the non-bowl participation, suddenly began to change his tune when noting that fund-raising could use a boost. "Let's think about it," Hesburgh finally said about bowl participation in the summer of '69, lending hope to the legions of Domers and subway alums who had long been clamoring for the Irish to accept postseason invitations. On the field, Notre Dame fielded another strong team in 1969, led by emerging jr. QB Joe Theismann, and mountainous DT Mike McCoy, but an early-season 28-14 loss at Mike Phipps-led Purdue, and a 14-14 midseason draw at home vs. Southern Cal, eliminated the Irish from serious national title discussion. Still, Notre Dame was a top ten team and figured to command a high-profile bowl bid if it reversed course on its postseason hiatus. In late September, the Notre Dame athletic board talked informally in favor of a bowl bid, and in late October the alumni board unanimously endorsed the recommendation and sent a committee to Father Hesburgh with the news. About this time, of course, word was leaking around the college football world that the Fighting Irish might be serious this time about breaking the school's no-bowl policy. Bowl committees, however, were understandably skeptical, having dealt with Notre Dame's rumor mill in the past. These were also the days before most of the major bowls had contractually-guaranteed spots with conferences. Aside from the Rose Bowl, which pitted the Big Ten and Pac-8 champs since the late ‘40s, and the Cotton Bowl, which had forever saved one spot for the champion of the Southwest Conference, bowl selection was a free-for-all in those days. Invitations could be extended as early as November 17, almost three weeks before the end of the regular season. That was also an era when negotiations between schools and the bowls would be taking place by midseason, if not earlier. With numerous Big Eight and SEC power teams, plus an unbeaten Penn State, very much free-agents in the selection process of the day, the big bowls wanted to make sure they could lock up an attractive matchup and were reluctant to save a spot for the Irish until the South Bend bunch gave a formal okay for its participation. The Orange Bowl, which in mid-November of '69 was still not sure Notre Dame was serious, might have been able to land the Irish had developments unfolded in a different manner. Parseghian was said to have preferred the Miami locale because of the desirable trip to Florida, night-time TV audience on NBC, and extra exposure with the Eastern press corps. But Joe Paterno's Penn State was not playing the will-we-or-won't-we game as was Notre Dame; the undefeated Nittany Lions were of course into the bowl mix with both feet, and had indeed made quite an impression in Miami the previous year in an exciting 15-14 win over Pepper Rodgers' Kansas Jayhawks in the Orange. The Miami connections knew they would have a hot commodity if they could land Penn State, which at that time seemed a safer bet than gambling on Notre Dame eventually breaking from its no-bowl policy in time for the New Year's night game. 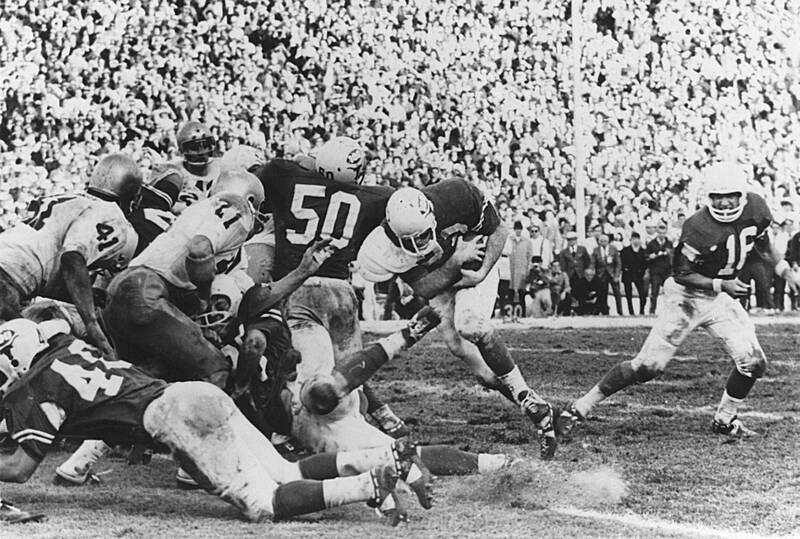 It's worth remembering that by mid-November of 1969, top-ranked Ohio State, a near-unanimous number one atop the polls since the outset of the campaign, but ineligible for the Rose Bowl due to the Big Ten no-repeat rule of the day, was expected to make the national title debate a moot point as long as it finished the regular season unbeaten, which it figured to do on November 22 against Michigan. And it was decision time for many bowls a week before. Paterno, not thinking a national title would be on the line for his fourth-ranked squad against either number two Texas or number three Arkansas (who still had a showdown planned for early December) in the Cotton, instead put a Miami (Orange), New Orleans (Sugar), or Dallas (Cotton) vote to his players, who preferred the former. (It was said that many black members of the Penn State team had no interest whatsoever in a New Year's trip to Dallas, considered much-more hostile territory for minorities in those days, and overwhelmingly approved sunny Miami.) Paterno thus told the Orange Bowl he would accept its bid. After an unbeaten Tennessee squad fell from favored status in mid-November when losing 38-0 to Ole Miss and Archie Manning, the Vols dropped from top-tier consideration, and while Notre Dame continued to ponder, the Orange instead set up a tasty matchup between Penn State and one-loss, Big 8 champ Missouri. Then, however, the college football world was turned inside-out by Ohio State's subsequent 24-12 loss to Bo Schembechler's first Michigan squad on November 22. The battle for number one immediately became a free-for-all, beginning with a stirring contest later that Nov. 22 afternoon between 5th-ranked USC and 6th-ranked UCLA, both 8-0-1 and suddenly feeling like they, too, had a chance. Meanwhile, it dawned upon the co-chairman of the Cotton Bowl selection committee, Field Scovell, and everyone else that the Cotton would have a number one team (the winner of the Texas-Arkansas showdown in two weeks) on the field in Dallas. Paterno, having instead enlisted with the Orange before the Michigan upset of Ohio State, would forever lament missing a chance to play for the chance at number one vs. the Longhorns or Razorbacks. Meanwhile, the Irish began to stir a bit more, warming to the idea of playing the highest-rated team possible in a bowl with a conference tie-in as opposed to one with a commercial sponsor. Scovell, who still had a rugged, functional, and workmanlike one-loss LSU team on the string for the Cotton, was initially skeptical when receiving a call from a well-placed Notre Dame connection that the Irish were seriously interested in a bowl. But as events unfolded in late November, the fit for the Irish in the Cotton became obvious. Soon, Scovell was consumed by the thought that Notre Dame would break its self-imposed bowl ban in his Cotton, against a number one Texas or Arkansas. "When you hear you've got a real chance to get Notre Dame for the first time in 45 years," Scovell said in an SI piece at the time, "you don't care about anything else." 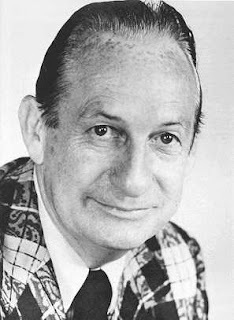 Scovell and Southwest Conference executive director Wilbur Evans then embarked upon a painstaking trek to South Bend, overcoming a blizzard, missed flight connections, and eventually hovering above South Bend, unable to land for hours, before finally touching down. Not willing to wait, Scovell rushed to a pay phone to call Notre Dame's Father Edmund Joyce, the school's executive vice president, who had been a proponent of the bowl. "You have nothing to worry about," Joyce assured Scovell, and presto, the Notre Dame self-imposed bowl exile was history. Meanwhile, Texas and Arkansas would proceed with their “Game of the Century” on December 6. (We have reviewed that game in a past Big 12 Retrospective piece). It was as good as advertised; the Longhorns rallied from a 14-0 deficit to pull out a 15-14 decision. President Nixon, a noted football fan, had hastily decided to attend the game and arrived via helicopter just before kickoff. (In the Nixon entourage would also be a Texas congressman, George Herbert Walker Bush). After the game, Nixon bestowed the national title honor upon the Longhorns, which caused the other unbeaten, untied team, Penn State, and HC Joe Paterno, to fume, but that’s another interesting story for another day. Still, there was still one game to go for Texas to officially claim a national title; UPI’s final poll in those days was before the bowls, but the AP poll waited and would be regarded as the final arbiter for real national title talk. Simply, the Longhorns had to beat Notre Dame in the Cotton Bowl to sustain their claim as number one. While college football historians not alive at the time, along with sorts like ESPN, have created the impression that Texas-Arkansas concluded the ‘69 season, there were a couple of more important chapters to be written in the bowls. And the fact is that almost all of December 1969 after the Texas-Arkansas game, Texas-Notre Dame was in fact generating more national interest and curiosity than any game in recent memory. Longhorns-Fighting Irish had huge appeal from a variety of angles, and in retrospect was probably the most fascinating (and important) game of that season...more even than Texas-Arkansas on December 6. Sports pages across the country were abuzz that December in anticipation of not only another chance to watch Texas after the heart-stopping win at Arkansas, but to finally see Notre Dame in a bowl. Then, on December 12 came word from Austin that Longhorn DB Fred Steinmark, who played in the Arkansas game, had his left leg amputated after a cancerous tumor was discovered just above his knee. Steinmark would hope to make an appearance on the sideline for Texas-Notre Dame. On top of the football hype, Horns-Irish now had a personal interest story to further captivate the nation. CBS would also have reason to be happy at the boffo audience the game attracted as the new decade dawned that Thursday morning, January 1, 1970. After a rainstorm had almost rendered the Cotton Bowl’s grass turf unplayable following the previous Sunday’s NFL Eastern Division playoff game between the Browns and Cowboys, the grounds crew did an admirable job painting over and patching up the mess on the field. With liberal use of sand, some of the muddiest patches became playable, though the pitch had a blotchy look. There was no use painting the Cotton logo at midfield, though sand and sawdust were able to camouflage the Cowboys logo from four days earlier. In the end zones, painted yellow and orange, outlines of the Browns and Cowboys logos could still be seen, though the end zones had the “Notre Dame” and "Texas" lettering. In a neat twist for Notre Dame, for the first time, the players had their last names on the backs of their white uniforms. The contrast of Notre Dame’s white and gold to the Texas burnt orange and white, the brightly-painted green (and it was mostly paint) on the non-blotchy parts of the field, coupled with a clear blue sky on a crisp New Year’s Day in Big D added further color to the dramatic proceedings. Nelson on CBS was ready to go at kickoff as Texas’ Happy Feller stepped into the ball, and ND’s Mike Crotty fielded the kick a couple of steps into the endzone. “And it is Crotty two yards deep in the end zone,” said Nelson. “Goal line-five, he’s out to the 10, 15, and up near the 20!” The real “Game of the 1969 Season” (if not the ages) was underway! The clash did not disappoint. Though, in the early going, it was not looking good for Texas, as the Irish were containing the ‘bone. Theismann moved the Domers smartly to an early lead on a 26-yard field goal by PK Scott Hempel. Then, on the second play of the 2nd Q, and the ball on Notre Dame’s 46, the Irish struck. As Theismann took the snap and rolled left, Nelson, who also doubled as the Irish play-by-play man for their C.D. Chesley-syndicated TV games during that era, sensed what might be coming in his normally excited tone. “Theismann still has the ball...outside...throws long to GATEWOOD GATEWOOOD GATEWOOD! And it’s a TOUCHDOWN!” Theismann’s deft faking had frozen the Longhorn secondary, and favorite target WR Tom Gatewood ran a deep post pattern, catching the ball in stride at the Texas 15 and waltzing into the end zone. It was a dream start for Notre Dame, and 20 seconds into the second quarter, the Irish were bolted to a 10-0 lead. Like big Buster Mathis, rattled by a quick knockdown in the second round vs. Jerry Quarry the previous March at Madison Square Garden, the Horns were momentarily stunned. Unlike Mathis, who could not recover and went on to lose a unanimous decision to Quarry, Texas was made of some stern stuff and began to fight its way back into the game. Needing to answer, Street steered a methodical 74-yard drive, capped by a short TD blast from HB Bertelsen. Before the half was complete, Street had the Horns on the move again. This time, however, the Parseghian defense stiffened, as LB Bob Olson twice stuffed Horn HB Billy Dale on 3rd-and-1 and 4th-and-1 calls from the Notre Dame seven. The Irish would hold their 10-7 lead into the halftime break. Into the third quarter, and the tension mounted. The field conditions, which had been deplorable for the Browns-Cowboys game four days earlier, began to deteriorate. The field paint and sand could only cover the patches of mud for so long; soon the pants and jerseys were mud-stained. Shadows were soon covering much of the field. Neither team could sustain a drive in the 3rd Q as the defenses dug in. Notre Dame, however, had become dangerously over-reliant upon Theismann, its ground game, unremarkable anyway that season, now effectively stalled vs. a swarming Texas defense led by DE Bill Atessis and LB Bill Zapalac. Meanwhile, on the field too long, the hearty Irish defense began to show signs of cracking. Royal’s triple option, unrelenting, finally began to wear down the Notre Dame stop unit. Methodically, Street uncorked a 77-yard drive early in the 4th quarter. Knocking on the door on the Irish 2, the Wishbone worked to perfection...even fooling the normally on-the-spot Lindsey Nelson. Street deftly faked on the first option, to HB Bertelsen on an inside dive, though it took Neslon a split second to recognize as much. “Bertelsen...no it is kept...it is kept and a touchdown Texas....Ted Koy!” Street had perfectly executed the textbook option pitch to HB Koy, who had a clear and short path into the end zone. With 10:05 remaining, Texas had claimed its first lead of the game, 14-10! 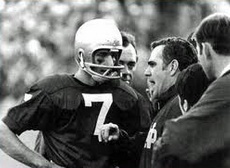 Theismann, however, remained dangerous and capable of pitching Notre Dame back into the fray, and, starting from his own 20 following the kickoff, immediately brought the Irish back downfield. Into Texas territory at the 24, it was time for a trademark Theismann, using his legs to wheel out of trouble in what for a moment seemed typical madcap fashion before delivering a mighty blow. As Theismann took the snap, he rolled right, but sensing trouble from behind, immediately wheeled around and began to roll left, retreating more than 15 yards behind the line of scrimmage at one point as he escaped Texas pass rushers while traversing almost the width of the field. “Now, can he find anybody?!? !”, asked Nelson excitedly on CBS as Theismann continued to roll left before pulling up at the about the 32 to throw back across the field in the opposite direction and into the end zone. For a moment, it looked like the pass would fall harmlessly incomplete, until Irish WR Jim Yoder, coming back to the ball after looking to get free deeper in the end zone, suddenly appeared. “Touchdown, for Notre Dame!,” exclaimed Nelson. With 6:52 to play, now the Irish had reclaimed a 17-14 lead. The difference between being remembered as a very good or an all-time great team for Texas would now depend on the subsequent drive. The Horns were not built to go the length of the field in a couple of plays, but there was sufficient time remaining for one more textbook Wishbone drive...if, that is, Street could pull it off. Though Notre Dame had yielded some yardage on the afternoon, it had done so grudgingly. If the Horns were to score, a little bit of Street magic, as in the memorable 4th-down pass to Randy Peschel in the Arkansas game, might have to materialize again. The Wishbone was still functional with this much time left in the game, and Texas rather quickly moved the ball into Notre Dame territory. But yards were becoming much harder to gain the closer the Horns moved to the Irish goal line. Fullback Worster, on his way to 155 YR, continued to pound at the middle. Soon, however, Texas would find itself at 4th down and 2 on the Irish 20 with 4:26 remaining. Horns PK Happy Feller had a strong leg and was easily within range to tie the game with a field goal. 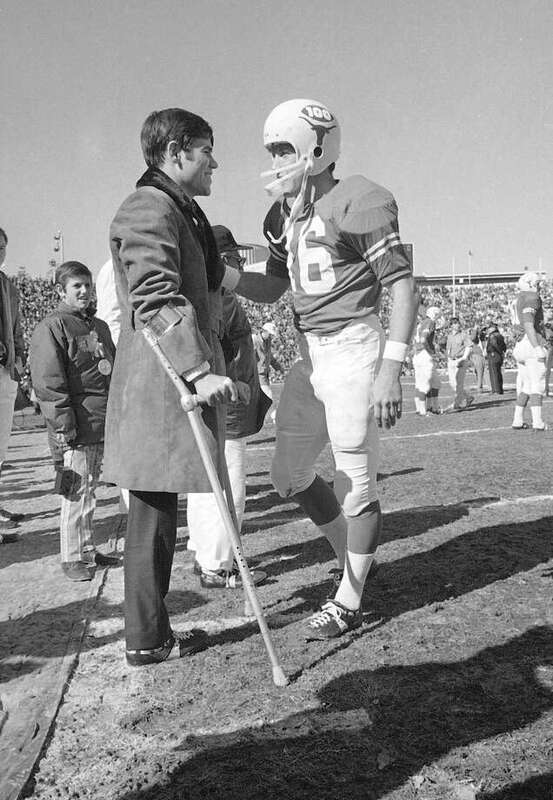 But Darrell Royal knew a tie might turn out as bad as a loss for the Horns with the pollsters if they wanted to win the outright national title, and even if Feller converted successfully, there would be no guarantee they could get the ball back with enough time to go for a winning score. As Royal huddled with Street on the sideline, it became apparent that the field goal was out of the question. Texas was putting it all on the line with this drive that had to end in a TD...or else. The 4th down call, like the earlier Koy TD in the same period, was another classic, textbook option, with Street faking then rolling left, holding on to the ball as long as he could before quickly flipping the ball back to Koy, who had just enough room to gouge out two-and-a-half yards. A measurement was required; Koy had succeeded, but just barely, gaining the first down by about a foot. On first down at the 18, Street worked the left side again, this time on a quicker pitch to Koy, but there was nowhere to run, and Irish DE Fred Swendsen wrapped up the Horn RB for a one-yard loss. On second down, the Horns kept it close to the vest, an off-tackle run by Bertelsen, who could get no closer than the 15. A nervy 3rd and 7 awaited as the clock ticked down to under 3 minutes. On third down, Street went option again, but this time winging to the right side. As the Irish closed down, he flipped back to the trailing Bertelsen, who was not going to get to the corner, instead turning inside and finding a bit of space, picking his way down to the 10 where Irish DB Ralph Stepaniak made the sure tackle. Another 4th-and-2 call awaited as Street again trotted to the sideline to discuss strategy with Royal. As in the timeout before the previous 4th down call few plays earlier, there was no thought on the Texas sideline to go for the tying field goal. Two minutes and 26 seconds remained. Royal and Street conferred before the coach called the play. “Left 89 out,” instructed Royal, calling for a pass to top WR Cotton Speyrer. Street, who had delivered the key play vs. Arkansas thru the air to TE Peschel, wanted to make certain he heard Royal correctly. "Coach, are you sure?," said Street. "Watch for the keep first," said Royal. "You might be able to fall for two yards. But if you can't, drill it to Cotton. He says he's open on the out." So, unlike the previous 4th down, Street was not going option-pitch this time, as he rolled left, looking to throw all of the way. Speyrer, who caught a team-best 30 passes that season and would end up playing in the NFL for the Colts and Dolphins, was the only target. Running his route straight into the end zone, Speyrer stopped and came back to meet the ball, having gained the necessary separation (barely so) from Irish DB Clarence Ellis. The only question would be if Speyrer would get to the low-ball before it hit the ground; diving at the 2, Speyrer would complete the shoestring catch. As in the Arkansas game with the pass to Randy Peschel, James Street had delivered on the clutch 4th-down play of the game using his arm, not his legs. The drive was now seeming interminable for Texas, which still had 2 yards to navigate to grab the lead. About this time, it might have occurred to Parseghian that letting the Horns score the TD on first or second down would at least give Theismann, by this time having put the fear of God into the Longhorn defense, a bit more time to move downfield for a potential winning score. A worst-case scenario for the Irish would be a Horns TD that would leave almost no time on the clock for a Theismann comeback. Notre Dame’s defense, however, was going to make Texas earn those last two yards. Street went to Bertelsen straight ahead on first down but the Irish barely budged, as DT Mike Kadish buried Bertelsen just outside the one. On second down, it was Bertelsen again off of left guard, but Notre Dame LB Larry Schumacher arrived at just about the same moment Street was handing off to Bertelsen. No gain! Now 3rd and 1 from the one and the time inside of 1:15 remaining, Parseghian realized he had to play the clock game and called a timeout. Texas, however, knew exactly what it was doing. Unpanicked on 3rd down, Street kept the ball on the ground, and had a down to work with as the right side of Notre Dame’s line had jumped offside. “Worster, Bertelsen, and Dale the three backs...and now, penalty markers thrown,” Lindsey Nelson described. But the play would continue, and, not blinking, Street handed to the second man through, HB Billy Dale. “And the handoff was taken by Dale, who bursts in...the penalty will be against Notre Dame!” Dale indeed had an ample gap to dart into before diving across the goal line. Texas had reclaimed the lead, at 21-17 after Feller’s PAT. Only 1:08 remained as the nation stayed gripped to CBS for the dramatic conclusion. .
Theismann, however, had the hot hand as confirmed by the previous TD drive. and remained capable of pulling a rabbit out of his hat. The Longhorn defense had tired of chasing Theismann all afternoon and by this stage was susceptible to surrendering big chunks of yardage, as on the Yoder TD. Speaking of that man Yoder, after briefly fumbling the ensuing kickoff, he would get control of the ball and advance to the ND 22. Theismann had 78 yards to navigate and 1:02 on the clock. On first down, another madcap Theismann scramble, after he had dropped straight back, then wheeling back around to the left, so similar to the Yoder TD pass, preceded a throw across the field to RB Denny Allan, who caught the ball at the Irish 39 for a first down. The lump in Longhorn throats got a bit larger on the subsequent play when Theismann dropped back and fired across the middle to a wide-open TE Dewey Poskon, who advanced to the Texas 39. With 38 seconds remaining, Parseghian would call another timeout. In two plays, Theismann had advanced the ball 39 yards...he was halfway to pulling out a Notre Dame miracle. The Longhorn defense was reeling, and it was nervous time for Texas fans in Big D.
On first down at the 39, on a play now looking familiar to everyone in Dallas and watching on TV elsewhere in the country, Theismann again rolled left, planted and once more threw back across the field, aiming again for his tight end Poskon, who was waving his arms as he momentarily broke open inside the 25. This time, however, Theismann’s pass sailed, over the outstretched arms of Poskon and into the hands of Horn DB Tom Campbell, who made a clean interception and brought the ball back to his 24. Game, set, match, and national title for the Longhorns, but not before a brief skirmish broke out on the sideline in front of the Texas bench. Referees quickly restored order; all Street had to do was fall on the ball two times before the game ended with the Longhorns 21-17 winners! When we talk about a game resonating for a half-century, we’re not sure if there was ever a better example than the 1970 Cotton Bowl. First, Notre Dame’s re-entry into the bowl mix was not going to be a one-off, as AD Moose Krause had suggested before the Cotton classic. The Irish were bowling to stay; there was a ballyhooed Irish-Horns rematch the following season that might be part of another upcoming TGS Retrospective. In fact, Notre Dame-Texas effectively ushered in an era when bowl execs would focus less on teams with deserving records and more on the TV ratings. Further, in the aftermath of January 1, 1970, sources have long told us that Penn State’s Joe Paterno, bitter at what he considered a poll snub, determined right then that his Nittany Lions would never get a fair shake from pollsters because of their location in the East. From that point forward, Paterno would not be interested in an official alignment with the Eastern independents for football, rejecting overtures from the Big East when it eventually formed a gridiron alignment alongside its hoops, though it wouldn’t be until 1993 that Penn State would fulfill the Paterno dream and enlist with the Big Ten. Meanwhile, note how the Eastern indies would eventually scatter, nowadays counting the Big Ten. ACC, Big 12, and American as their home leagues. Had that old alliance stayed together, much of the conference hopping we have seen in recent decades might never have occurred. Many still believe that the eventual splintering of the Eastern alliance actually began during bowl season 1969, with the Texas-Penn State debate (a controversy at least in the mind of Paterno) as the catalyst. Lastly, for the teams themselves. Thanks to its courageous effort vs. Texas, Notre Dame, ranked No. 9 in the AP poll entering the Cotton, would jump up to No. 5 in the final rankings, an unprecedented leap for a bowl loser. 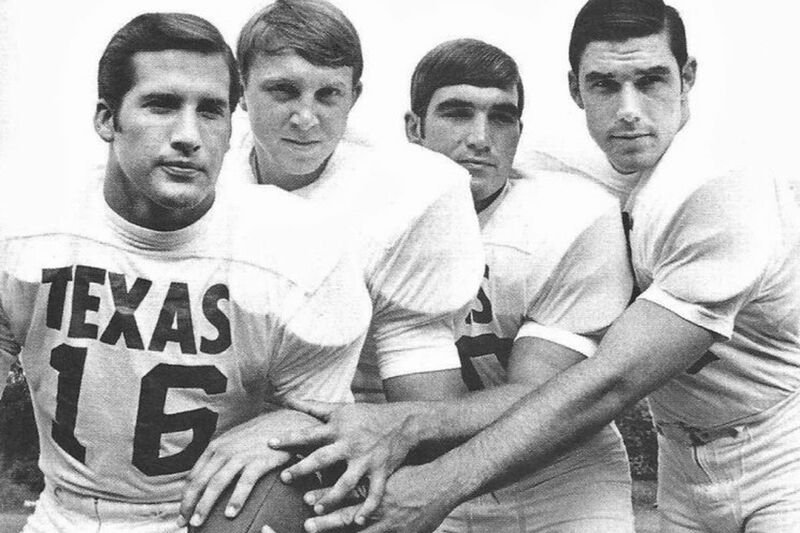 But the real glory was reserved for the Longhorns, whose dramatic win would cement the '69 squad's place among college football's all-time best teams. That’s a lot of resonating for one game!